Back in 2012, when my daughter began to show signs of mental ill health, we found ourselves thrown into a secondary health care system that I naively believed would have all the staff and resources our daughter needed to make a quick and full recovery. Most importantly I also believed that our daughter would at the very least have a similar continuity of care that she’d experienced for the first 13 years of her life from our wonderful GP. Sadly, that wasn’t the case then and certainly isn’t now. In fact, access to therapy and other support for mental ill health is entirely dependent on where you live in the country. In the 21st century, in the 6th richest country in the world, our underfunded and under-resourced National Health Service is a postcode lottery of care. If you are a young person and lucky enough to live in the part of London where your care falls under the Royal Free, you will have access to an intensive outpatient team who have the skills and resources to treat you in the community. Here continuity of care is a given and even the sickest patients – for example, those suffering with an eating disorder – can be certain that they will sleep in their own beds at night. The lead consultant Dr Mark Berelowitz’ goal is to keep patient’s lives as normal as possible by keeping young people in ‘adolescent life, not anorexic world’. Although on occasion inpatient care is required, it is so rare that it has proven unnecessary for the hospital to fund a unit on a long-term basis and instead will purchase beds only when needed. This model of care is not only cost effective but more importantly the patients there, unlike my daughter, do not have to endure long distance separations from family and friends at a time of great vulnerability. Had our daughter had access to such a progressive model of care, she could have avoided the greatly damaging effects of long term inpatient care. The pain and grief of hospitalisation, especially when so far from home, undoubtedly causes lasting trauma. Self-harming and other maladaptive coping mechanisms so often begin when an inpatient soon becomes the norm and is then very difficult to deal with post-discharge. The damaging nature of being in such close contact with other sufferers, especially in the area of eating disorders, can be a normalisation of the illness to the extent that it becomes part of a person’s identity. This is especially damaging for young adolescents who are at an important developmental stage when they are beginning to discover who they are and form their identity. When my daughter was first hospitalised far from home I never once considered that the admission would be so long or that it would be a situation that would be repeated over and over. Yet research is clear. Once a person is hospitalised, it is extremely likely that not only is it likely to be the first of many admissions but also that recovery will be prolonged, and prognosis worsened. With little opportunity for rehabilitation post discharge and access to a ‘step up’ intensive service if required too many end up relapsing and the cycle of admission and discharge is perpetuated. And what of the family trying hard to support a relative especially when placed some distance from home? For the years following my daughter’s diagnosis, our whole family were utterly consumed not only by the illness but by a system so fragile and fragmented that I became ill myself and needed acute care. My middle daughter too became so crippled with anxiety due to the many long-distance separations from her sister that she would be unable to attend school. What is often ignored and certainly underestimated is the extent to which our mental health is entwined. Without parity of esteem, the system not only causes suffering to an individual but effects the family and society as a whole. I know that despite the difficulties and indeed trauma that we as a family have endured, we are lucky. I have a partner who has been able to support me financially when I had to give up work as well as a strong network of family and friends. Through our own actions, we have been able to finally get some continuity of care and a therapy that can begin to resolve the trauma of the past few years. Many have not and will not be so lucky. That is why myself and other friends in Nottingham have set up the campaign group Mental Health – Time for Action. 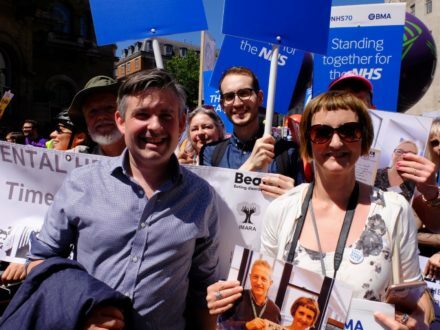 During the recent NHS rally in London we delivered our petition of demands and Mental Health Charter to Downing Street. Our main priority is to make mental health provision a top priority and challenge ongoing privatisation and cuts to the NHS at all levels. We also are demanding treatment options that include access to trauma resolution therapies and transformational funding to ensure early intervention and intensive outpatient care is a reality for all. Rachel Bannister is a mum whose campaign against failures of Child and Adolescent Mental Health Services led to a meeting with Jeremy Hunt.